This campground is great if you would like crowds and lots of bear activity. The views are gorgeous, the campgrounds are fairly clean and have access to many amenities such as small stores restaurants and call the touristy stuff that Yosemite Valley has to offer. This would be a great place to take your family if you are not big on roughing it. It is good for younger children and a good first exposure to the outdoors. Also, if you eat at the Hotel restaurant the squirrels get inside and run around :-). This is a great campground to use as a stopping point on the JMT. If you were hiking the traditional route, it is a nice point to meet family or friends, have a hamburger, and get geared up for the next leg of the trip. 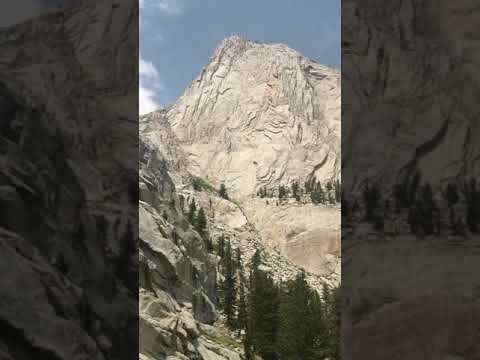 Great if you are hiking Whitney as a base camp! this is a great campground to use as a base camp before you summit Whitney. The staff is friendly and helpful and the portal is just a few minutes away with the store and small restaurant. Lone Pine is close about a 10 minute drive away. Best Secluded Campground for new campers! This is a great campsite to go to if you are car camping folk. They have a small camp store right outside the park, Hot Springs, the swimming pool on making great hiking in the area! Comfy and cozy, Tons of Amenities! This campground is a great place for families who want to try out camping and haven’t done much of that. They have a small restaurant, awesome new swimming facility, Bike rentals and so much more! We stayed here just for fun once and also while attending San Diego comic con. It is very close to the Metrolink train that takes you to the convention center. This is a great campground! Very clean, close to the bay, calm waters, and great amenities kayak rentals bike rentals and other great options!